Tambora came to life on April 5, 1815 after lying dormant for thousands of years. It produced an explosion that was so loud soldiers hundred of miles away in Java, thinking they had heard cannon fire, suited up for battle. A few days later came the climactic explosions. Three columns of fire shot up from the mountain and a plume of smoke and gas reached 25 miles into the atmosphere. The eruptions ended in July. 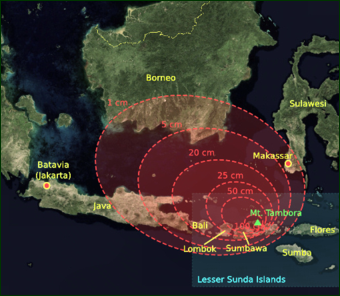 The Tambora blast was ten times more powerful than the Krakatau explosion (see Below). It darkened the sky at noon and produced energy equivalent to all the nuclear bombs in the world. Between 26 and 43 cubic miles of material was discharged (a recorded world record), around 12 cubic miles of gases, dust and rock was blasted into the atmosphere. The explosions created a five-mile-wide crater and reduced the elevation of the mountain from 13,450 feet to 9,350 feet. Pyroclastic flows roared down the slopes at 100 miles an hour and incinerated grasslands and forests and everything else in their path. Fire-generated winds uprooted trees. Huge floating rafts of pumice trapped ships in their harbors. Ash rained down for weeks on areas hundreds of miles from the volcano. The roofs of houses collapsed. Freshwater sources were contaminated and crops and plants died. Tambora is situated near the northern edge of the island of Sumbawa in the West Nusatenggara Province, between the islands of Lombok and Flores. It can be reached in a few hours from Bima by a very bumpy bemo or bus ride. A road climbs up about a third of the way to the summit on the southern slope. From here you can take a trail that switches back and forth to the summit. After several hours you reach the 1000-meter-deep crater. Not many people do the climb because the road to get to the trail is very poor and the bus ride is long and bumpy. Mount Tambora is known to the world as the site of the largest and most deadly volcanic eruption in recorded history. Just like Mount Toba in North Sumatra, it is recognized as one of the world’s supervolcanoes. 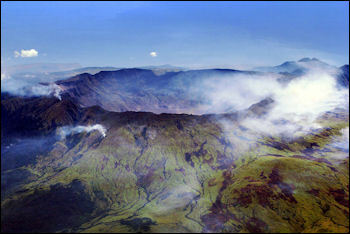 However, while Mount Toba hasn’t been active in tens of thousands of years, Mount Tambora is still regarded as active. 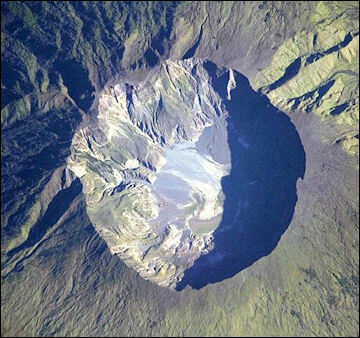 The mega-eruption of Mount Tambora plunged the Earth into a multi-year period “volcanic winter.” It left a a seven-kilometers-by-6.2 kilometers wide crater containing a two-colored lake with depths reaching 800 meters, considered as the largest crater lake in Indonesia after Lake Toba. In 2004, archaeologist Haraldur Sigurdsson discovered the preserved bodies of two adults buried in nearly 10 feet of ash in the remnants of a small village on the volcano. Today, aside from attracting seismologists, volcanologists, archeologists, biologists, and other scientists, Mount Tambora is also known as a prime destination for mountaineers from all over the globe who enjoy the thrill of conquering its challenging tracks. There are two ascent routes to reach the caldera. The first route, the Doro Ncanga starts from Doro Mboha Village southeast of the mountain. This route follows a paved road through a cashew plantation until it reaches 1,150 meters (3,770 ft) above sea level. The end of this route is the southern part of the caldera at 1,950 meters (6,400 ft), reachable by a hiking track. This location is usually used as a base camp to monitor the volcanic activity because it only takes one hour to reach the caldera. The second route starts from Pancasila village northwest of the mountain, known as the Doro Peti is steep. Using the second route, the caldera is accessible only on foot. The climb to the caldera usually takes two days through dense forests. The marvels of Mount Tambora also lie in the two conservation areas situated at the foot of the mountain. The first is the 18,178.66 hectares Mount Tambora South Wildlife Reserve (Suaka Margasatwa Gunung Tambora Selatan) that offers hilly and mountainous landscapes and steep valleys. Among some of the animals that dwell here are: Wild Boars (Sus scrova scrova), Timorese Deer (Cervus timorensis), White Parrots (Cacatua galarita), Red Chest Perkici (Tricoglosus haematodus mitchelli), and Yellow crowned Parrots (Cacatua sulphurea).Visitors can observe the traditional process of collecting natural honey. The second is the South Tambora Hunting Park situated south of the Wildlife Reserve. As the name suggests, the site is a perfect place for those who wish to conduct hunting safaris. Here, there are a great number of deer and wild boar running freely, making it an exciting place to hunt. 1815 Tambora explosion Tambora’ss explosion created the huge quantities of sulfurous gas which mixed with water in the air, producing a cloud of sulferic acid, ash and dust that was blown around the world by stratospheric winds. Ice cores taken from Greenland in 1815 and 1816 show unusually high levels of sulfur, a remnant of the Tambora explosion. In “Tambora: The Eruption that Changed the World,” Gillen D’Arcy Wood describes how Tambora consumed whole villages in “a vortical hell of flames, ash, boiling magma and hurricane-strength winds.” The blast was six times more powerful than the eruption at Mount Pinatubo in 1991 and it dwarfed the one that destroyed Pompeii. Haraldur Sigurdsson, a volcanologist from the University of Rhode Island, told The Guardian: "We know that in an eruption such as that in 1815, that pyroclastic flows extend from the volcano in all directions to a distance of at least 40 kilometers [24 miles] radially and within that zone ... there is an extinction of all life." The remains reveal how the village's 10,000 residents were probably wiped out within moments as the avalanche of hot volcanic ash, rock and gases, known as a pyroclastic flow, struck. The civilisation on Sumbawa island has intrigued researchers ever since Dutch and British explorers visited in the early 1800s and were surprised to hear a language that did not sound like any other spoken in Indonesia, Prof Sigurdsson said. Some scholars believe the language was more like those spoken in Indochina. But not long after westerners first encountered Tambora, the society was destroyed. "The explosion wiped out the language. That's how big it was," Prof Sigurdsson said. "But we're trying to get these people to speak again, by digging." Artefacts uncovered at the site suggest that Tambora people may have had trade links with Indochina. Pottery uncovered nearby resembles that commonly found in Vietnam. The dig will help volcanologists predict the potential dangers of volcanoes which remain active today. By feeding details from Tambora into computer models, they can estimate the lethal reach of those volcanoes should they erupt. "Events of this type will occur in the future, and we should be aware of what could happen," said Prof Sigurdsson. So much material was in this cloud that it lowered temperatures around the globe and produced blizzards in the Midwest and snowfall in the U.S. east coast and London in August, caused poor harvests in New England and Europe, and killed water buffalo and flooded rice crops in China and Tibet in what became known as the year without summer. One Virginia resident wrote. “In June...another snowfall came and folks went sleighing...On July 4, water froze in cisterns and snow fell again, with Independence Day celebrants moving inside churches where hearth fires warmed things a mite.” Among other things the volcano is believed to have produced the appalling weather that disrupted Napoleon at Waterloo and caused crop failures and famines that lead to social unrest throughout Europe. The gloomy weather inspired Byron’s poem Darkness and is believed to have had a hand in creating the characters Dr. Frankenstein and the monster by Bryon’s friend Mary Shelley.